Several Minnesota Twins prospects who played for the Cedar Rapids Kernels helped the Scottsdale Scorpions win the Arizona Fall League championship title Saturday. The biggest contribution came from 2013 Kernels outfielder Adam Brett Walker II, who drove in three runs in Scottsdale’s 6-4 win over the Surprise Saguaros. Walker spent the 2015 season in Double-A, batting .239 with 31 HR and 106 RBI in 133 games. He was named the 2013 Topps Midwest League Player of the Year after batting .278 with 27 HR and 109 RBI in 129 games with the Kernels. He led the Midwest League in home runs and runs batted in, and his 83 runs scored were good for second in the league. LHP Taylor Rogers earned the win in the AFL title game, striking out two and giving up two hits and no walks in three scoreless innings. He spent the 2015 season in Triple-A, going 11-12 with a 3.98 ERA, 126 strikeouts and 44 walks in 174 innings. He pitched two complete games. Rogers pitched in the Midwest League in parts of two seasons. In 2012 he went 2-2 with a 2.70 ERA, 35 strikeouts and 12 walks in 33.1 IP for the Beloit Snappers. He made three starts for the Kernels in 2013, giving up 12 runs (eight earned) while striking out 10 and walking four in 10 innings. RHP Nick Burdi got the save in the AFL title game despite giving up a solo homer to New York Yankees prospect Dustin Fowler. Burdi split the 2015 season between High-A and Double-A, cumulatively going 5-6 with a 3.82 ERA, four saves, 83 strikeouts and 35 walks in 63.2 innings. Burdi pitched 13 innings in 13 games for the 2014 Kernels. He posted a 4.15 ERA with four saves, 26 strikeouts and eight walks. Two other Twins prospects, RHP Trevor Hildenberger and RHP Jake Reed, each pitched a scoreless inning of relief for the Scorpions in the AFL title game. Hildenberger started the 2015 season with the Kernels, going 2-1 with a 0.80 ERA, 14 saves, 59 strikeouts and five walks in 45 innings. He ended the season in High-A, where he went 1-1 with a 3.32 ERA, three saves, 21 strikeouts and two walks in 19 innings. Reed appeared in 44 regular-season games in 2015 (nine in High-A and 35 in Double-A), cumulatively going 5-4 with a 5.01 ERA, two saves, 46 strikeouts and 22 walks in 59.1 innings. He pitched in 16 games for the 2014 Kernels, going 3-0 with a 0.36 ERA, five saves, 31 strikeouts and three walks in 25 innings. Chicago White Sox prospect Adam Engel was named the Arizona Fall League’s Most Valuable Player after the outfielder led the AFL in batting average (.403), on-base average (.523) and slugging percentage (.642). He spent the 2015 season in High-A, where he batted .251 with 7 HR, 43 RBI and 65 SB in 136 games. Milwaukee Brewers prospect Yadiel Rivera was given the Arizona Fall League’s Dernell Stenson Sportsmanship Award, which is named in honor of a Cincinnati Reds player who was murdered while a member of the AFL’s Scottsdale Scorpions in 2003. It is presented annually to the league’s player who best exemplifies unselfishness, hard work and leadership. Rivera, an infielder whose primary position is shortstop, played 133 games in Double-A and Triple-A this year before making his major-league debut for the Brewers in late September. He batted .253 with 2 HR, 44 RBI and 12 SB in the minor leagues this year. 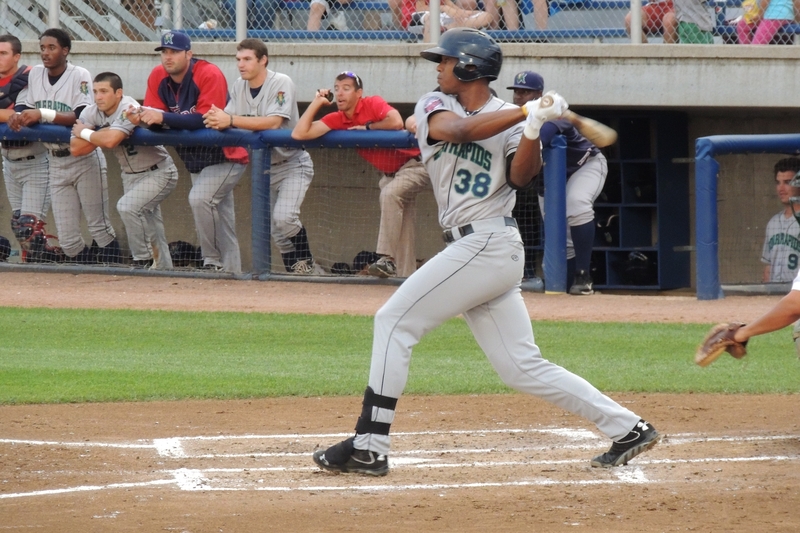 Rivera played 159 games with the 2011-12 Wisconsin Timber Rattlers, batting .238 with 13 HR and 54 RBI. Incidentally, Stenson was drafted by the Boston Red Sox in 1996 and played in the Midwest League the following year. He batted .291 with 15 HR and 80 RBI in 131 games with the Michigan Battle Cats. This entry was posted in Arizona Fall League, Beloit Snappers, Cedar Rapids Kernels, Midwest League, Wisconsin Timber Rattlers. Bookmark the permalink.